One of the biggest problems with owning an electric vehicle (EV) is 'range anxiety': worrying if you will run out of juice while away from your home or any location where you can charge up. Petrol or diesel car owners who suffer from this kind of anxiety, while driving through remote areas, can easily carry a can or two of fuel but carrying extra batteries is not feasible in EVs with current tech. Nevertheless the electric powered wheels of progress continue to turn, and EVs with ever improved ranges, new battery tech, and more and faster charging stations pop up in the news quite frequently. It's important for these developments to continue to progress as various countries lay out plans for a petrol/diesel car free future. This weekend saw a very important EV milestone surpassed. As Engadget reports, "Tesla Owners Club Italia drove their Model S P100D 1,078km (669.8 miles) on one charge, setting a new long-distance record (the previous was 'just' 901.2km) and becoming the first to drive a production EV more than 1,000km before plugging in." 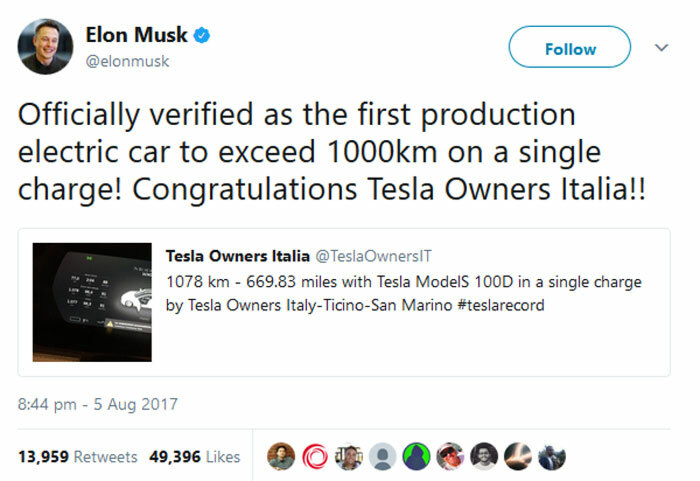 Tesla owner Elon Must was among the first to congratulate the Italian Tesla owners club. It is noted that the team didn't drive around as a regular business commuter or weekend leisure driver might. A number of 'fuel' saving techniques were employed by the drivers of the Tesla Model S P100D on their journey around and area of Salerno. For example, the driver sought to maintain a speed of 40km/h (24.9mph), used smooth driving techniques, and low rolling resistance tyres were put on. Nothing extreme was done, like removing extra seats and other components to make the car lighter, for example, but the driver did have to do without air conditioning. To surpass the 1000km milestone at the rather sedate energy efficient road speeds took 29 hours, according to the Tesla Owners Club Italia. Driver boredom might have been overcome somewhat by the use of the Autopilot functionality. The official range of the P100D is 613km (381 miles) but this can drop by tens of kilometres, depending upon road conditions, passengers/loads, and the behaviour of the driver. The high temperatures being experienced in southern Europe last weekend would have helped to make the cells more efficient. 25mph!…I bet they were popular on busy roads. My only problem with electric cars is when the batteries get old and they have to be replaced, this is more like the nuclear power problem, nice for a couple of years but radioactive waste just like old batteries needs to be dealt with. And another boring aspect is with the new battery technology which get advertised every year on tech sites but those technologies never make it to the light, call it the OPEC of battery tech. ANOTHER important issue: Countries all over the globe only generate 5 to 10% extra electricity (like UK), what will happen if there is a 100% increase of electric cars every year? Out of interest are EV inlet ports all the same standard and are all electric stations compatible with the different makes?